This half term, in our topic work, we will looking at a Geography/History-Based topic, linked to Halecroft Park. We will look at the work of Edgar Wood and how his designs for the park affected the local area over time. This will involve map-work, looking at settlements and transport links. The key question - Is Hale A Good Place To Live? The topic work will be linked to other areas in the curriculum, including Literacy, ICT and Art & Design. There is also Book Week, the 1st week of this half term, where children will enjoy a host of activites with a reading focus. Our chosen book is 'Treasure Island' by Robert Louis Stevenson. There will be opportunity to get dressed up as a character from the book on Friday 1st March. 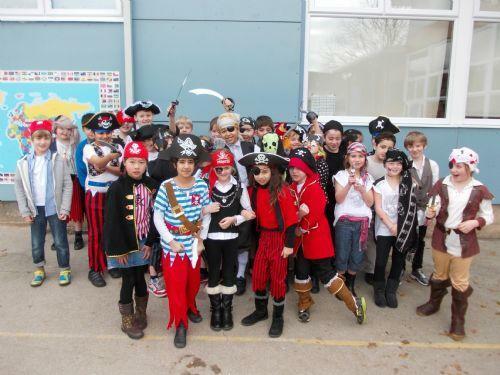 Shiver me timbers...I wonder what characters children will come as? Here's a clue, look above. There will also be author visits by Diana Shaw and Adam Perrott. Diana showing us her work. Septimus Smythe and the Spectra Detectors! Recital from her first book!